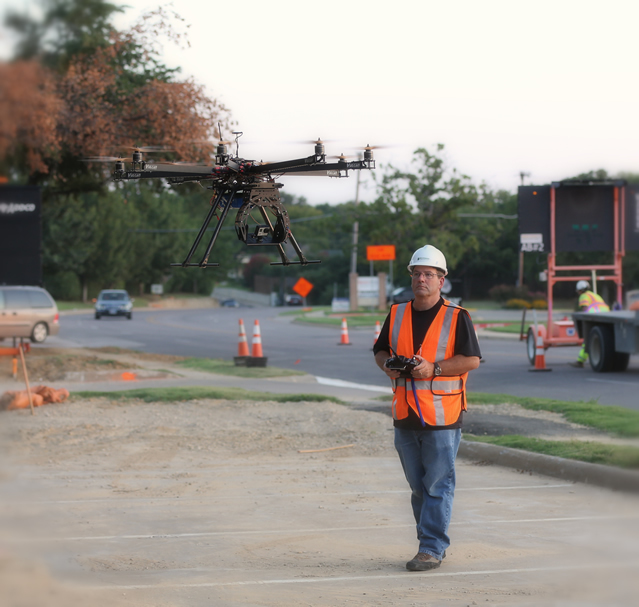 Drones Corporate Video Production - Why Use A Drone? Drones hit corporate video by storm over five years ago. They were a video production tool that offered a fresh and different view. And they were cool. Until they flew into the client’s car or that building. And looking back five years ago, there were two levels of drones– the consumer level (DJI had just introduced the original phantom) and the professional level (custom built kits, some with eight blades that could carry the big cinema cameras). Back then, there were many hurdles to using drones in corporate video. First and foremost was legality. The airspace in the US is regulated by the FAA, and to accept any money for use of an aircraft in the FAA’s airspace, you had to have a commercial pilots license. This could take years and upwards $60K to obtain. And with the sudden proliferation of all these consumer (or call them hobby) drones, most videographers said screw it, and took to the skies. The FAA was behind the curve, but several years ago, they gave one concession: they implemented a program where they would grant “exemption” from the commercial pilot’s license, so that the drone operator could make commercial use of their drone. This was called the FAA 333 Exemption. But to be the pilot in charge (PIC), you still had to have some level of pilot’s license. And it took a long time to get your Exemption. (We were one of the first ones to get our 333 exemption in Dallas and Fort Worth). And then one year ago, the FAA brought to a close the 333 program by starting a newer one– the 107 UAV (unmanned aerial vehicle) license. Now, many videographers could apply to get licensed to fly drones commercially. Drones have been known to fail. They have just fallen from the sky. They’ve taken off in some weird direction. Early on, I had a phantom 2 just drop from the sky (several times, different drones). I also had one just take off one direction until it hit something. We had a large, custom built octocopter that flipped and flew itself into the pavement. (Here’s a video of an earlier problem with the octocopter: https://youtu.be/AEmzxYBXjgg ) The early days of these drones came with a bunch of bugs. Fortunately today, many of the bugs have been worked out and the drones are much more stable and reliable. So we talked about the Consumer level of drones briefly above. Today, there are lots of brands at the consumer level and prices can go from $20 up to $800. These include the Parrot line, Yuneek, and DJI hobby line of drones and their competitors. The price difference is usually going to be because of the quality of the camera and the stability of the gyro the camera sits in. At the highest consumer level for drones, you’re talking GoPro quality. This is fine for a lot of usage, but if you’re in lower light, or need high resolution, they’re not ideal for the job. Enter the Prosumer level of drones. These are going to be the top of the line DJI Phantom, Yuneek Typhoon and 3DR Solo (before the company stopped making drones) and the DJI Mavic. Cameras are better (still not great in low light) and these drones have more features, like obstacle avoidance and programmable flight paths. At the top level, you have the professional drones. These are the ones that have great cameras, or the ability to carry high end cameras. They include the DJI Matrice line Inspire line, and Yuneek has some higher offerings. Now your cost is going to be over $2K and possibly close to $10K or over depending on what you get and what kind of cameras. For a search and rescue drone, you can spend $15K just on a thermal camera alone before you even buy the drone. Fortunately for corporate video, there’s not as much call for a thermal camera. If all you need is some social media videos, then quality might not be crucial. But you pretty much have to go with the prosumer level to get video from your drone that’s acceptable to post. But if you’re needing high end aerial photography and videography, you will need the use of a professional drone. Your video production company can help direct you to the right tool. Here’s a video featuring some of our drone work.